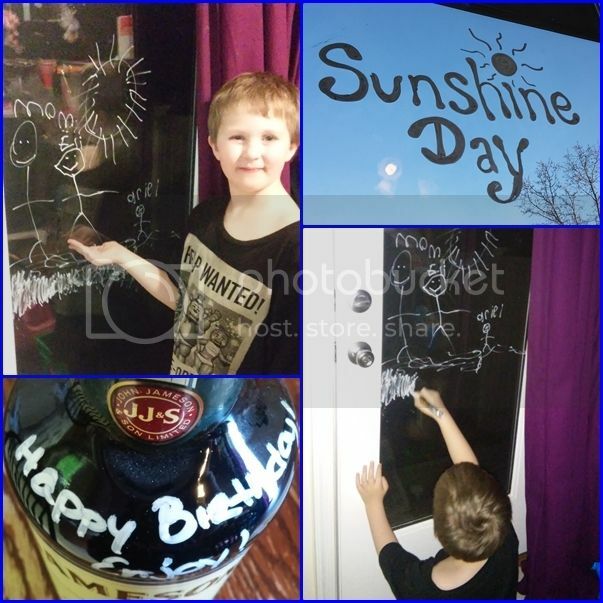 Elijah loves to draw and write with chalk and dry erase. He loves sidewalk chalk, blackboards, dry erase boards, you name it, so when I saw the Chalko White Chalk/Liquid Markers I knew it would be a hit with him! 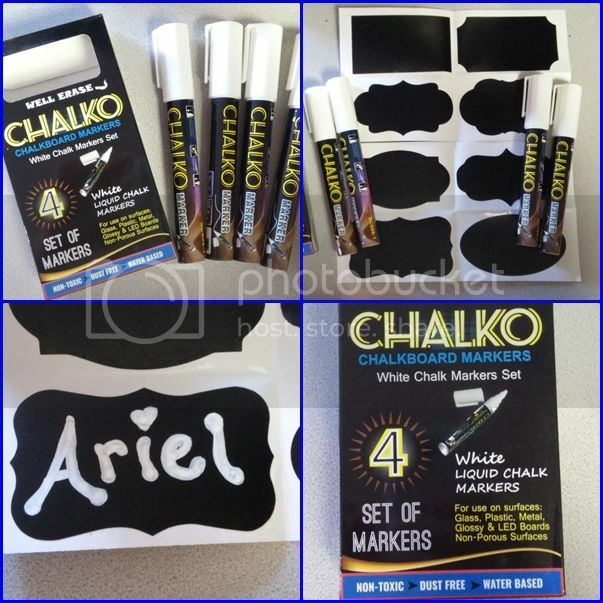 Chalko Markers are water-based pen's with 6mm reversible tips, so you can get fine or bold lines easily without the mess or running paint! Since they are water-based you can write on virtually anything and it wash off quickly and easily, especially when it comes to the hands of your small artist. Glass, Metal, Plastics... the only limit is your imagination! In the box was 4 markers and 2 sheets of 8 chalkboard labels. The labels are great, about the size of name badges or a little larger than a business card! I am looking forward to using them on some bins of Ariel's toys so they can easily be labeled and identified without pulling out the bins and they are so cute! I love that I can erase them and change the label as her toy categories change. Elijah was on hand of course to try out the markers. We both noticed right away how easily and smoothly the pen started right from the box. You do have to prime them, of course, but we were able to press ours down about 3 times each and the tip was sufficiently saturated and we were ready to start drawing. I tried my pen on numerous things, the window, some bottles, the glass on the stove, the toaster. It all went on and dried quickly and then was cleaned off again almost effortlessly. Elijah chose to go right for the big window on the backdoor as his canvas and loved that he could erase as he was working if he 'messed up' but it still dried quick enough that he didn't smear it as he was working. I also love that unlike regular chalk there's no dust! I loved how well these markers drew on all the surfaces and already have so many ideas how I can use them in the future! These would be great for anybody with kids, businesses, artists and more! When it was time to clean up I noted the caps snap securely onto the pens giving you peace of mind that they won't be leaking or, more-likely, drying out in between uses. To clean the surfaces we were able to wipe it off with a dry paper towel or for fast clean up a baby wipe, a single spray of window cleaner, or even a little water took it all right off in one swipe. Ideas for Improvement: I don't think it's immediately obvious that the tips are reversible for different sizes. If you didn't know when using the pen there is no indication it does this unless you read it. Some other people might not notice as easy either. They came all 4 pens in the pack came with the thick tip in use. If they had 2 thick and 2 thin to start with it might help to point that feature out! To switch the tips you do have to touch the tip to pull it out and rotate it so you do get a little ink on your hands, but it's the very minimum. I do however recommend going ahead and switching two before you prime them to the thinner that way you don't have to switch them again. Would I buy it myself based on my experiences with this review? YES! I was provided the product complimentary for testing purposes in exchange for my honest unbiased opinion but would definitely buy it again! I put a lot of though into my amazon reviews whether they are test products or stuff I bought myself based on other people's reviews because honest thorough reviews are the only way we know if what we are buying is actually worth our hard earned money!